It seemed that, at last, Ghana’s time had come. They had finally stopped riding their luck. They had finally run out of steam. Or at least that’s the way it seemed for the first half. Seemingly completely indifferent to the basic idea of potentially even trying to win this game, their ponderous play at both ends of the pitch meant they were lucky to go in at half-time not behind. Collectively realising this as the referee blew his whistle for half-time, they gravitated towards the centre of the pitch for a huddle, with this sudden epiphany causing a considerably different Ghana side to come out in the second half. It was like chalk and cheese – they were wearing the same white kit, but they were a different team (reference: Steve Komphela). They did novel things such as dribbling and forward passing, making the overt attempts to get into DRC’s box that were so sorely missing in the first half. 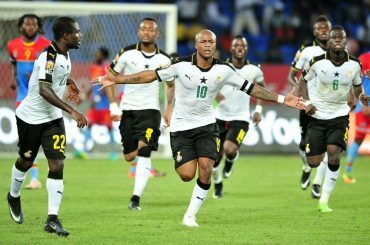 Andre Ayew and Christian Atsu drew defenders with their direct running, and Jordan Ayew managed to make his presence felt for once, nicely shrugging off a challenge to score a magnificent goal to open up a 1-0 lead. It was then Brother Andre who stroked home the penalty soon after. Whatever was said it that huddle, it obviously worked. Weirdly, their poor performance in the first half almost lulled DRC into a false sense of security, which they effectively exploited thereafter. A shoutout should also go to the defence, who – in a slightly ‘untraditional’ manner – held off the myriad of attackers DRC threw on, despite centre-back Daniel Amartey definitely deserving a red card for a horrific challenge beforehand. A breath of fresh air in almost all respects, it was with a tear in our collective eyes that viewers of this tournament said goodbye to DR Congo. Providing an excellent balance of flair, organisation and obscurity, they were eclipsed what this tournament is all about, giving an excellent showing of themselves in what was overall a very balanced game. It will be the missed chances they will regret, however. Dieumerci Mbokani missed an absolutely stunning chance early on in the match, almost profiting from a terrible Harrison Afful pass-back to only misguide the ball onto the post. It was an odd game from Mbokani in which he demonstrated the fundamental disjuncture that plagues him as a footballer; demonstrating the aerial ability and hold up play of a world-class target man with all the composure and finishing of a springer spaniel. Ending with at least five strikers on the pitch by the end of the game, it was ironic that a team so blessed with striking talent conspired to miss so many chances. You can debate what Ibenge might have done differently. Perhaps more game time for Bakambu. Maybe they became too reliant on a particularly purple patch of Junior Kabananga. Quite possibly their defence was never going to hold strong the whole way through. But he has done incredibly well with this team, taken an unstable and erratic bunch and moulded them into something cohesive, improving greatly from 2015. One would hope we continue to see him in charge, as a rare opportunity to see not just a non-European but a manager of the same nationality at the helm. Now in their sixth-straight AFCON semi-final, this is a stage that Ghanaians are all too familiar with. With the second half against DRC arguably the only notable football they have played, they are once again relying on the pool of talent they have to draw upon to drag them through to the latter stages, despite a lack of world-beating performances. Up against Cameroon, however, they have a very good chance of making the final for the second year in a row. Cameroon – who very much scraped through against Senegal – are by no means an overly difficult task to overcome. Faced with fairly limited resources to draw upon and possibly having used up much of their luck already, Ghana will be licking their lips at sleepwalking through another tie. The trouble with Ghana is that you feel like you keep going over old ground. You feel that this is the year that they’re going to let you down, but they stumble through, very much personifying Avram Grant more generally as a team. Maybe this will be their year, but even if it is, it will only be the sizeable fan base with internet access that will make it seem like a big deal.